We’re huge fans of bread machines; they’re simple to use and produce tasty fresh bread. The settings are all pre-programmed for you. Just pop in your ingredients as directed, select your program and away you go. Even better, there is very little mess to clean up when all is finished. Some machines don’t only bake bread. They can make pasta, pizza doughs, and even yogurt. One such machine is the Aicock bread maker. Time to see what it has to offer us. Aicok has been supplying kitchen appliances to households across North America and Europe for many years. This brushed stainless-steel model is just one of the appliances they offer. It measures 10.2 by 13 by 10.6”, making it compact enough for your kitchen countertop. It also won’t take up too much storage space on a kitchen shelf or in the pantry. The Aicok bread maker has the capacity for three different sizes of bread, including small (1.1 pounds), medium (1.7 pounds), and large (2.2 pounds). You can also select how crusty you would like your bread to be. Choose from: light, medium or dark. The darker the finish, the crustier the bread. There are 15 different programs you can choose from, which produce a variety of savory or sweet bread, cakes or yogurt. The bread options include French, gluten-free, whole grain, multigrain, sourdough, milky loaf, and sweet bread. You’ll find a program for cooking bread quickly, as well as a simple-bake function. The program numbers are listed on the lid of the bread maker just above the clear LCD display. There is a timer function so you can set the machine to bake up to 15 hours in advance. 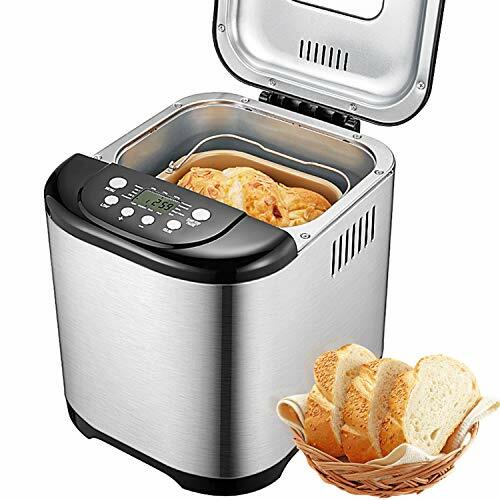 The keep-warm setting ensures your bread will remain hot for up to an hour. If you happen to have a power outage, there is a 15-minute window during which the machine will restart. The detachable lid has a clear viewing area, where you can keep an eye on what is cooking inside. The bread barrel and kneading hook can be removed for easy cleaning and both are dishwasher-safe. The appliance and removable parts have a non-stick interior to make removing the contents easy. It also comes with a measuring spoon, measuring cup, dough hook, and user manual. The manufacturer offers a two-year warranty and a 30-day return policy. Should You Buy the Aicok Bread Maker? We have a lot of positive things to report about this bread maker. First, it’s very easy to set up and use. Gather your ingredients, put them in the bread pan, close the lid and select your program. The listing displayed on the lid means no referring to manuals to make sure you have chosen the right one. The bread can be baked in as little as one hour using the quick-cook setting. The quality of the finished product is excellent. Even my mother (who believed the only way to bake bread was by hand) has been converted. She loves the crusty, fresh bread this appliance produces, and we’re both fans of saving time, money, effort and mess. The fact that you can leave your bread to bake while you get on with other things is a big bonus. Another positive is the timer function that allows you to preset the cooking time. It also turns out surprisingly good cakes. Not such a good thing if you are watching your waistline, however, at least you know exactly what’s in them. There are just a couple of glitches I’ve encountered, however. It took a few tries to get the exact loaf I wanted. I found the medium and dark settings are way too crusty for my taste. But I guess this is a matter of personal preference. Additionally, the gluten-free recipe ingredients may need adjusting as the resulting loaf can be a little too heavy. Although this is more a criticism of the recipe than the machine. One of the beauties of having a bread maker at home is the freedom to bake fresh bread and cakes whenever it suits you. If you fancy waking up to the smell of bread baking first thing in the morning, you can. Just set the timer before going to bed, and enjoy a warm, crusty loaf for breakfast. The Aicok 2-pound bread maker has a plethora of settings for many types of bread and cakes. It also lets you make yogurt. If you’re thinking of buying a bread maker, this multipurpose appliance would be a welcome addition to any kitchen.